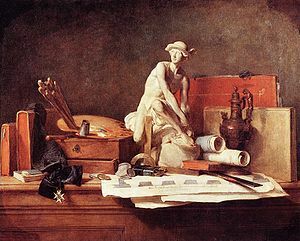 Jean-Baptiste-Simeon Chardin (1699-1779), The Attributes of the Arts (1766). Art, in the modern and most common use of the word, is the process or result of making material works (artwork) which, from concept to creation, adhere to the "creative impulse" — that is, art is distinguished from other works by being in large part unprompted by necessity, by biological drive, or by any undisciplined pursuit of recreation. Works of art include drawings, paintings, sculpture, literature, poetry, music, film, sequential art, and many other art forms. A person who creates art is known as an artist (or more specifically, a painter, illustrator, sculptor, author, poet, actor, etc). However, many people use the term "art" in a more restricted sense, roughly equivalent to the visual arts and plastic arts. When an institution is labeled as an "Art Museum", one expects to see drawings, paintings, and sculpture; rather than literature, poetry, music, or film. This restricted sense also tends to be limited to the fine arts, as opposed to commercial art or works of craft. According to Ayn Rand, Art is "a selective re-creation of reality according to an artist's metaphysical value-judgements. Art is the stylization of the essential or significant aspects of a subject/concept. Art requires a theme (or at least a problem to be dealt with in action films) — a unifying idea — to integrate the material elements into a single entity." This page uses content from Wikipedia. The original article was at Art. The list of authors can be seen in the page history. As with Spanking Art, the text of Wikipedia is available under a copyleft license, the Creative Commons Attribution Sharealike license. This page was last edited on 20 February 2012, at 22:29.